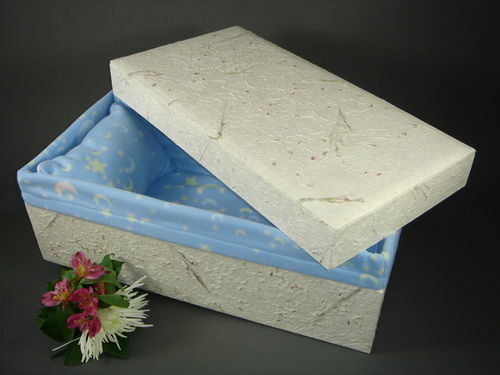 This sturdy biodegradable paper casket with fitted lid is covered in a soft handmade paper impressed with flower petals. A poly-fleece lining is available from the maker, but wrapping in your own natural fabric comforter is what we recommend. 12.5" x 6.5" x 4.25"
19" x 9" x 8"
22" x 11" x 7.5"
32.5" x 14.25" x 11"